Ibiza Rocks House at Pikes recently announced a collaboration with Groucho Club who will ‘pop up’ at the House for four days of exclusive events combining the very best of both venues. Groucho will bring their expertise in arts, food and culture to the boutique hotel and party spot that is popular with artists, islanders and industry insiders. This is an apparent meeting of two minds with a shared appreciation and understanding of the real Ibiza: a creative hub on an inspirational island. 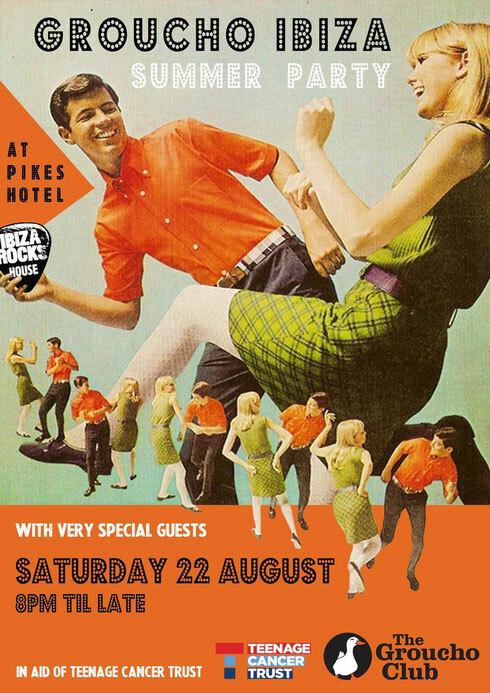 Groucho Club Meets Ibiza Rocks House at Pikes will take place from 19-22 August. The series of events during the collaboration at House start with Groucho hosting the Spandau Ballet after-party to their Ibiza Rocks live gig (Weds 19/08). Members and guests can also enjoy Intimate dinners hosted by guest chefs including Tom Parker Bowles and Richard Turner and as Groucho celebrates 30 Years, an array of cultural contributors to its biography will also be dropping by to mark the occasion. Popular on the island as a highlight of the Ibiza party season, the apparent pinnacle of the pop up is the annual official Groucho Summer Party in aid of Teenage Cancer Trust, which will take place at Ibiza Rocks House at Pikes on Saturday 22 August.